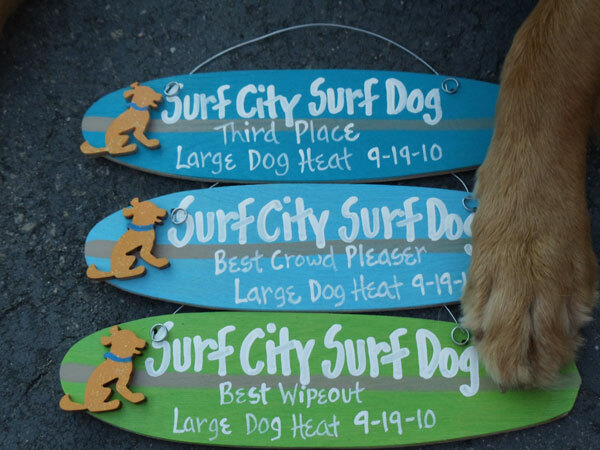 The Surf City Surf Dog competition began in 2009. At the inaugural event, Ricochet and Patrick did an expression session and surfed tandem in between surf heats. Ricochet was also a charity partner for a couple years. 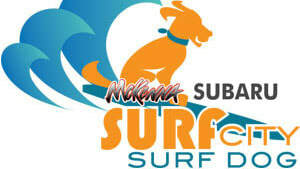 McKenna Surf City Surf City Surf Dog is a world famous dog surfing competition. It’s held annually in late September in Huntington Beach, CA. The event brings together the community, surfers, dog lovers, families & pets for three days of doggone fun and "fund"raising! The event is free to attend and includes a surFUR expo, pet adoptions, canine play zones, vendor booths, food trucks and family-friendly activities. Heats are based on dog’s weight and include owner launched and handler launched categories. A shredders division and tandem heats are also part of this event. Surf dog competitors have twelve minutes to catch their top five waves. They will be judged on confidence level, length of ride and overall ability to ride the wave. The series has benefited charities such as the French Bulldog Rescue Network, Westie Rescue of Orange County, Golden Retriever Rescue, Barks of Love, OCSPCA, and Huntington Dog Beach. For complete details visit the Surf Dog Events website. Ricochet won several of the Surf City Surf Dog Competitions.